If you don't want to use real money, you can setup any bank to use stars or even time. Mix and match star, time and real money banks to make iAllowance work best for you. Furthermore, you can assign an optional interest rate to any of the banks to help teach your children the value of saving money over the long term. 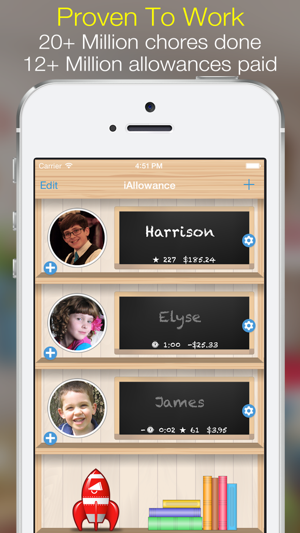 Track all your children's chores with iAllowance. Get your kids involved in the process and watch the chores get done! 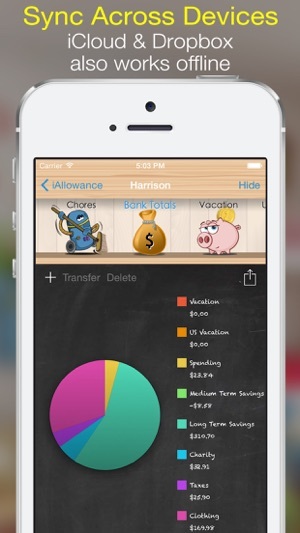 Use the reminders to push alerts to your kids - even if iAllowance is not running. - Updated for iPhone Xs, iPhone Xs Max. - Updated for new iPads. - Cleaned out the cob webs and updated a bunch of items on the backend to set the stage for great things to come. I love how easy it is to keep track of how much my kids have earned. It's great for on the go when we're at the store and they see something they really want, I can quickly check if they have enough money. 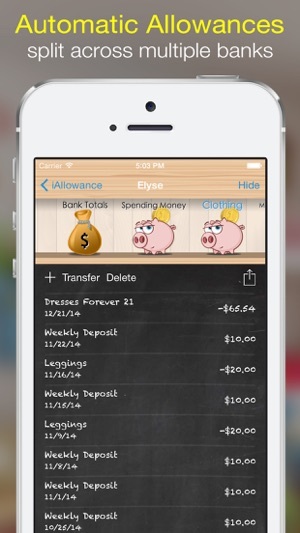 Love that I can predetermine their savings and charity money and it works automatically. Some reviewers said navigation was hard, but I found it fairly intuitive. Yes, it takes a little bit of time to figure the app out, but it's not terrible. I have always based my kids allowance on the amount of chores they've completed (getting the stars), but there is no option for this. They get their allowance whether they've done their stuff or not. I have to manually do a transaction to take money away that they didn't earn. I really wish there was an option to base allowance on stars. (Or keep it the same way since some people do pay the same every week no matter what.) Not sure why I put in there that each star was worth 10¢ because it doesn't really matter. Also, I've been able to sync to my iPad and my son's iPod, but not my other son's iPod. I've tried both the opulence syncing (all of their iPods are I my account) and through Dropbox, but for some reason it always syncs with the one iPod but not the other. It makes it hard when I have 4 kids trying to record their jobs everyday...they always want to record all at the same time, of course. If those two things worked, this app would be perfect in my opinion! Was PERFECT for what I wanted to track. 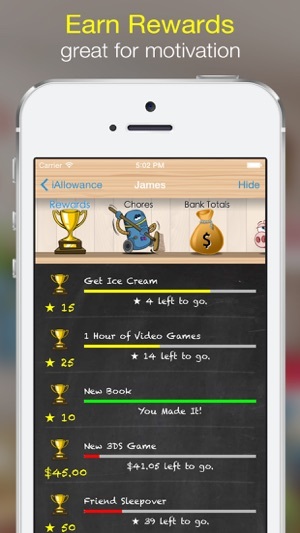 I love that you can track time and assign minute amounts as rewards for chores. 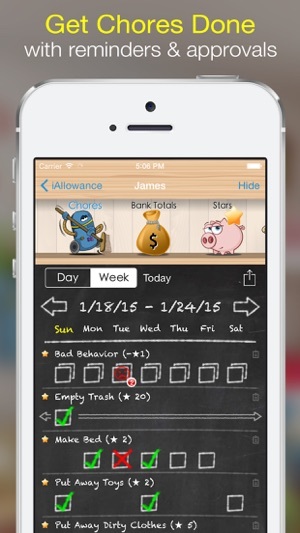 We use chores as a way to earn "screen time" (tablet, video games, tv) and this has been an amazing way to track it. The kids love seeing that check mark that adds time into their "bank" and I added a monthly allowance that is automatically added to their bank on the first of every month. 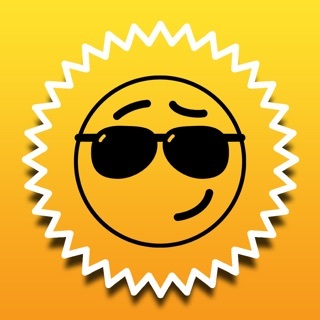 I can't recommend this app enough. Once you take the time to set it all up, it is a complete breeze to use. And changing or adding things is easy once you know your way around the app. Love it! Thank you for making something so useful! I want to love this! - I want this to work.